WordPress is undoubtedly the most popular way of building a website. But when it comes to choosing WP as a web-home for a project, people are bombarded with tons of information where WordPress.com and WordPress.org seem like two different notions. WordPress.com VS WordPress.org – what is the difference? In what cases shall one choose WP.com? How much does it cost to run a website on a fully hosted type of WordPress? 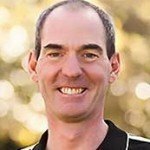 Is it possible to move the current website to the hosted WordPress? 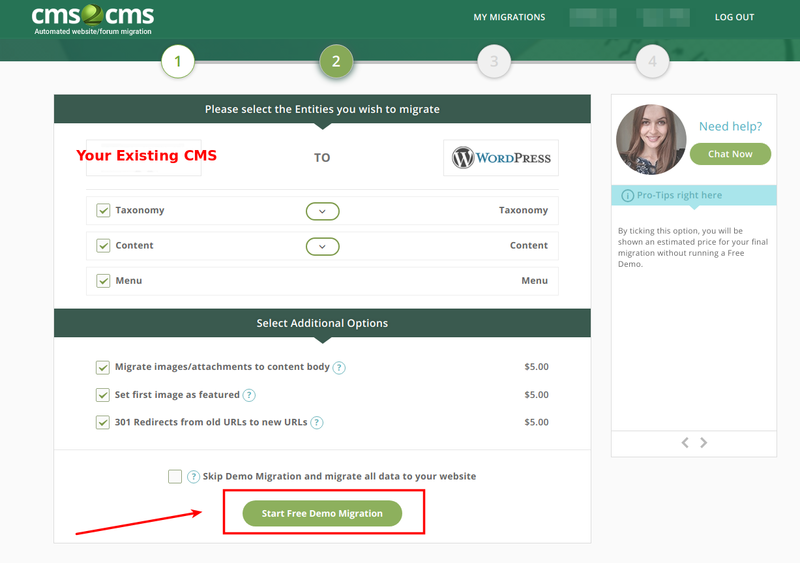 What is the fastest way to migrate content to WordPress.com? Let’s go! The following information is supposed to be useful if you have at least some “relationships” with WordPress. 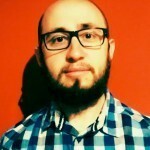 The key difference between WP.com and WP.org lies in control, hosting, in other words. All WordPress software is located at WP.org, which actually is a free open source CMS. What does it mean? 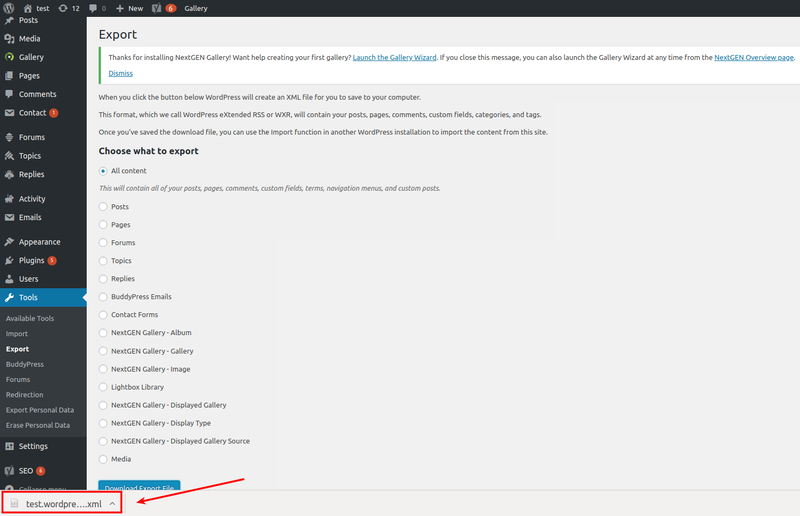 If you download WordPress from WordPress.org – you host it. You supply it with your own hosting provider and start using with your website. This type of WordPress gives you lots of flexibility as far as it’s a self-hosted WordPress. WordPress.com in its turn isn’t something totally different. It’s the same platform, but with hosting service included. That’s why it’s called fully-hosted WordPress. Actually, WP.com is based on WordPress.org, but there’s no need to download any additional software. You just sign up for a WordPress.com and have a live website right away. 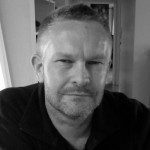 When shall I use WordPress.com and how much it will cost? At first sight, fully-hosted WordPress looks quite limited: no plugins, no themes, except the ones WP.com offers and no backend code. But with WP.com there’s no need to worry about purchasing hosting and website maintenance. As for the price of having a website on a fully-hosted WordPress, there are two options to choose from. Free plan lets you have a website with up to 3 GB of data along with a subdomain – it looks like yourwebsite.wordpress.com. Note that within Free plan WP.com ads is included. If you decide to get more powerful features, you may choose one of the paid plans. Be ready to pay from $3 to $8 for a personal website and $8 to $45 for a business or online store per month. In short, if you are a complete novice in WordPress but want to make sure that it’s really top platform – fully hosted WordPress is just the ticket! It costs you nothing, and after using for some time you can decide whether to switch to open source WordPress or not. Still, real experience is the best help while decision making, isn’t it? 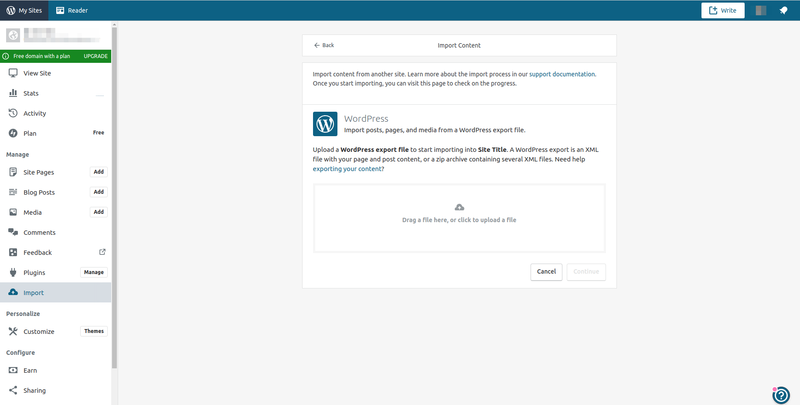 How to move content to WordPress.com and is it possible to do in an automated way? Content is the most precious thing any website has. 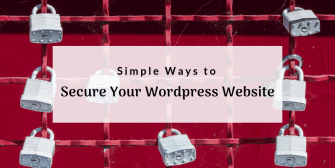 If you are running a website on another platform but because of that attention around WordPress, want to switch, of course, the first thing you are afraid of is losing your content. 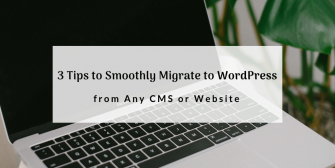 As far as CMS2CMS is one of the most trustful service offering fully automated forum and website migrations, we did our best to provide you with a possibility to migrate content to the fully-hosted WordPress. To begin with, create an account within CMS2CMS service by filling in all the necessary fields. You can also use your Facebook or Google profiles. 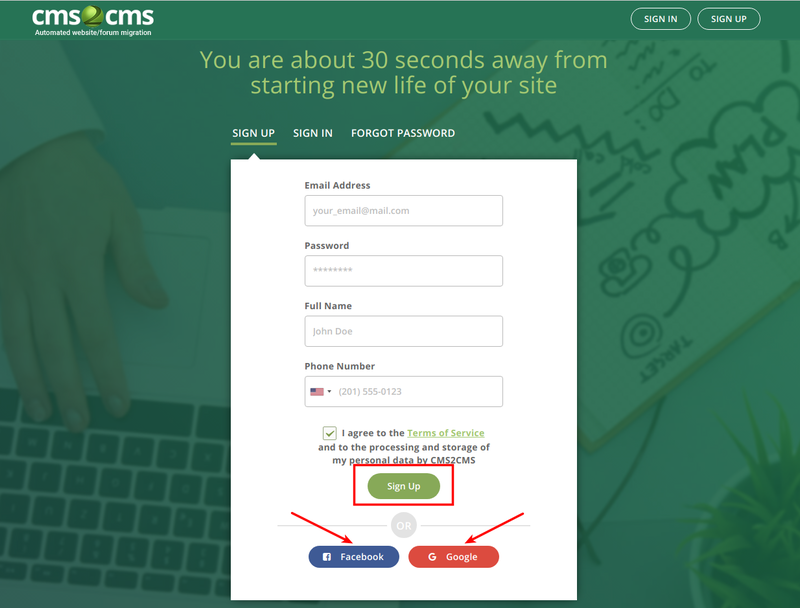 Choose your current CMS platform from the dropdown menu and provide the URL of a website you want to migrate. Press “Verify Connection” button. 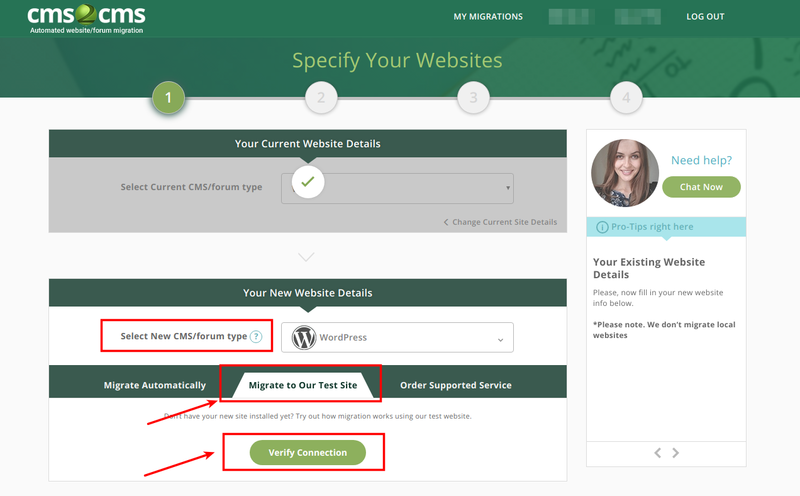 From the dropdown menu, select WordPress as a target CMS platform and choose “Migrate to CMS2CMS Test Site” tab. Again, press “Verify Connection” button. Now, you have an opportunity to indicate what entities you want to be migrated and to try Free Demo migration. It will cost you nothing, but you will be able to see how the service works. Free Demo Migration is done. You get the necessary access details to log in to the test site. 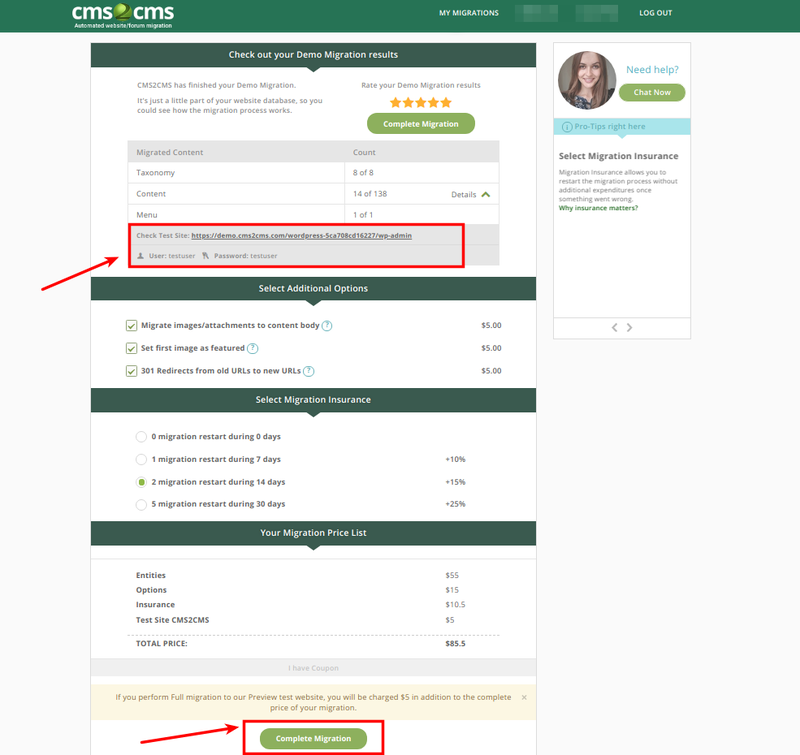 Now you are to move all your content to the CMS2CMS Test WordPress site. Please, press “Complete Migration” button. 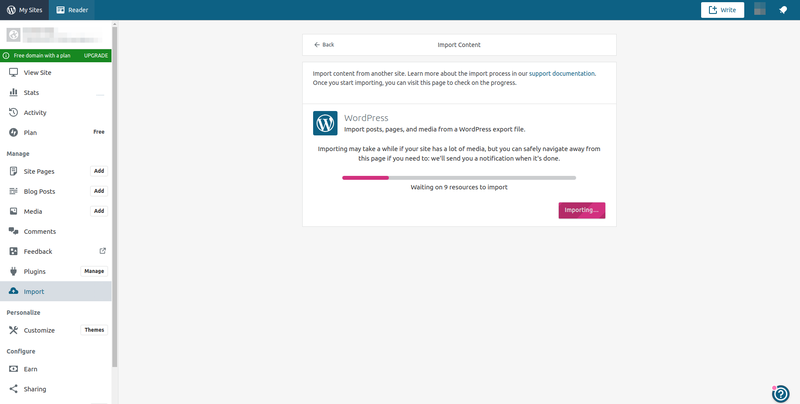 After the complete migration is finished, you have to go to the Admin panel of the WP test site and download the Export file. To do this, click “Tools → Export → Download Export FIle.” Here you have a possibility to choose what content has to be exported. The file will be saved in .xml format. Now, having the .xml file with all content in it, you are fully armed to perform migration to WordPress.com. To do this, you have to create a website on a fully hosted WordPress. In case you already have one, feel free to scroll down the following points. That’s it. Now you are an owner of a fully-hosted WordPress website. 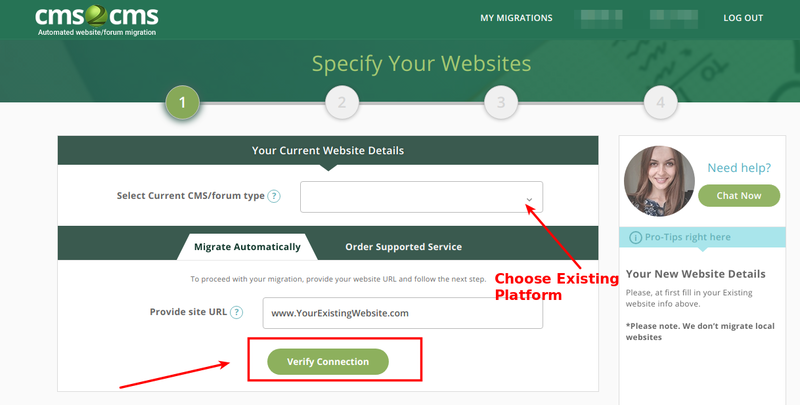 You are one step away from the final migration to WordPress.com. Let’s do it right now and let the journey begin! 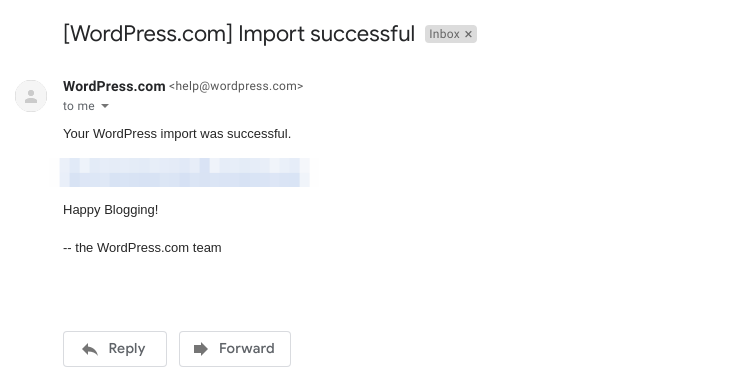 On the admin panel of your newly-created WP.com site, find “Import” section. 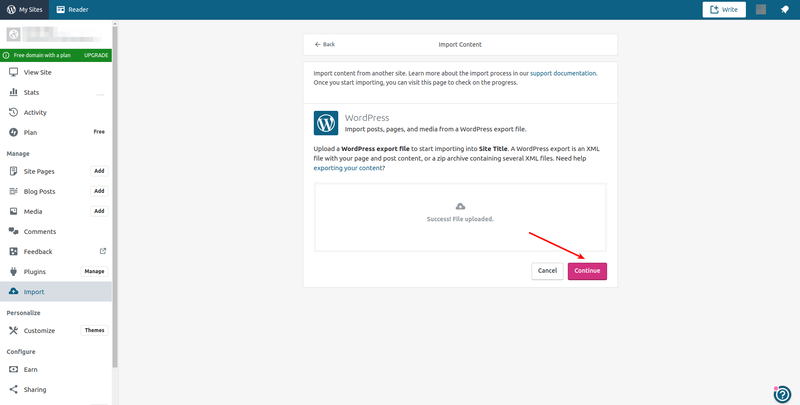 As far as we are moving content from the .xml file which was downloaded from WordPress, choose “Start import” next to WordPress. Please, note that only posts, pages, comments, custom fields, terms, navigation menus, and custom posts will be moved as far as not all the entities can be detected by WordPress. Upload the .xml file with your content to the provided box. When the file is successfully uploaded, press continue to start the content import. 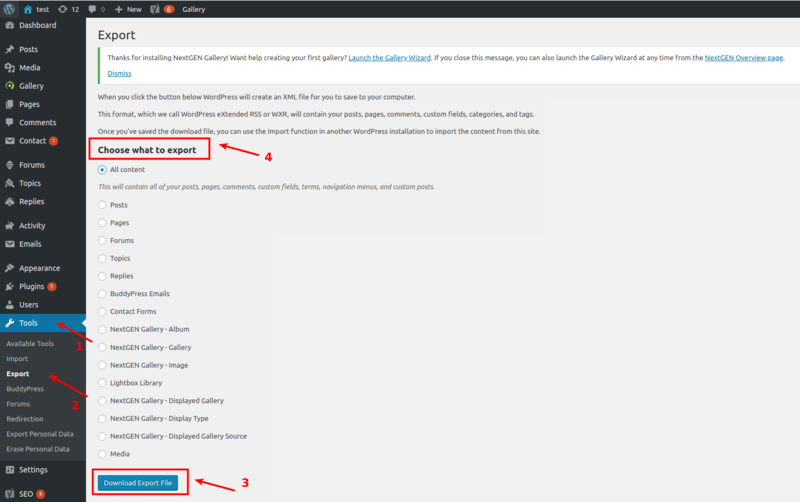 When the content is successful moved to WordPress.com, you will get an email notification with a link to your website with all content on it. I really hope that you’ve already found the very CMS platform for running your web-project. And no matter whether it’s WordPress or something else, if you feel comfortable and all your needs are met – this is wonderful. But still, if you are dreaming of working on WordPress platform, CMS2CMS is here to make your dream come true. 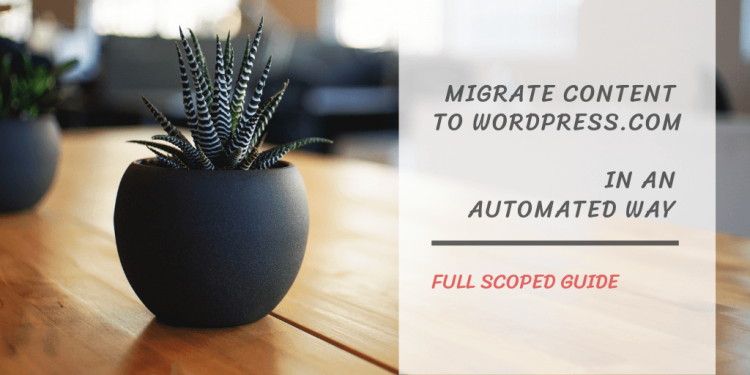 Fast, accurate, safe and what’s the most necessary fully automated content migration. 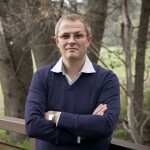 Move your data to WordPress.com and become a part of a huge and user-friendly WP-family. CMS2CMS has been really professional and really helpful in the way they assisted me for the migration of a website from Joomla 2.5.28 to Joomla 3.5.1.